By Jeremiah Owyang, Founder, Crowd Companies and Alan Webber, Government Insights Research Director, IDC, (profile and twitter). Last week, A version of this article appeared in the WSJ. The Collaborative Economy is emerging as the defining societal narrative for 2015 and beyond. In this burgeoning, economic model, individuals use commonly available technologies to obtain resources from their peers, like use of homes, cars, money, and other goods and services. These technology-based companies enable people to bypass inefficient corporations, find favorable alternatives to entrenched, established channels, and confront existing, draconian, government regulations. How big is this market? We know that the startups in this space have already been funded with nearly $11 billion, Most of that funding has come in just the last few years. According to PwC, this movement could be worth $335 billion by 2025. Sharing and circular economy strategy was a featured topic at the World Economic Forum at Davos in January, an indication that we should expect to see more Collaborative Economy models and businesses emerging in the future. Early sharing idealists hoped the sharing model would produce a Libertarian Socialism in which, by using technology, people would operate communally, sharing their homes, foods, clothes, etc. The injection of billions of dollars of venture capital to fund infrastructure and growth for these tech startups means that investors will demand a return in their investment, resulting in IPOs and a return to Wall Street economics. In reality, this is actually a form of tech-based capitalism, not the app-powered, hippie communes some perceived it would be. As social movements, markets, and industries grow and become more visible, they also become larger targets for politicians and bureaucrats trying to keep public interests in hand, extract relevant tax revenue and spin them for political value. The Collaborative Economy is no exception. Each individual facet might be seen politically as either a positive or a negative. For example, eBay, one of the older sharing marketplaces, allows people to recycle goods and receive money for it. A liberal might consider eBay as a positive in that it reduces the amount of waste that is deposited in landfills and because of the additional tax revenue it generates. A conservative might see eBay as a positive in that it provides a platform for individuals to start and build their own businesses. 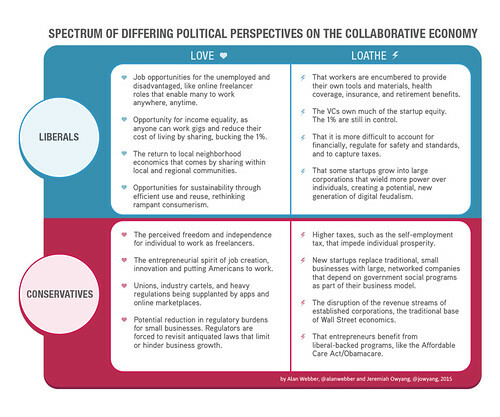 Both liberals and conservatives have embraced different aspects of the Collaborative Economy. For example, Senator Marco Rubio (R-FL), speaking at the DC Uber office, praised the “innovative startup,” backing the idea of breaking the juggernaut of big unions and regulated medallion cartels. Rubio said that, “regulation should never be a weapon that is used by connected and established industry to crowd out innovation and competitors” (Miami Herald). Uber recently hired David Plouffe, a political strategist for the Democrats who was the campaign manager for both of President Obama’s presidential races. Liberal politicians haven’t embraced specific startups in the Collaborative Economy in any political messaging or action, but some have embraced the idea that the underlying social and economic architecture that allows this new economy to grow is dependent on social programs like Obamacare to provide for the growing number of freelancers and small entrepreneurs. California was an early adopter in proposing legalizing many forms of ridesharing, led by the Public Utilities Commission in 2013. The City of San Francisco has legalized Airbnb, gleaning a 14% hotel tax from its transactions. When it comes to the emerging Collaborative Economy, the only thing that is clear is that there is no definitive ideological line. Both liberals and conservative see aspects of emerging companies and business models that they like and dislike. These technologies will amplify behaviors and value propositions from both perspectives. A new, more flexible, regulatory framework across all levels of government may be necessary if these companies can’t, or won’t, effectively self-regulate. These regulations would likely focus on providing levels of protection for contract labor from both established companies and end users. Startups, taking a page out of the dot.com playbook, will be quick to hire politically-connected individuals and lobbying firms to push their case for more flexible regulatory programs in city council chambers, state capitals, and in Washington. Expect a new lobbying group to emerge to protect interests across the entire Collaborative Economy. Both political parties will attempt to use this to their advantage in appealing to the American public. Expect the liberals to point out the benefits of sharing within the concept of the Circular Economy highlighted at the World Economic Forum in Davos. It wouldn’t surprise us to see the Right replace Joe the Plumber with “Carl the Uber Driver” and use the sharing economy to appeal to conservative values like independence, community, and resilience. Sitting in the back of a car during an Uber or Lyft ride, it is possible to see that, like any other company or business, the Collaborative Economy has many different facets that are either liked or disliked across the political spectrum. But, what both sides can agree on is that the Collaborative Economy takes advantage of technologies in both existing and emerging industries, empowering the working person, building resilient and sustaining communities, and leveraging the government for economic benefit. From the liberal left to the conservative right, there’s no clear ideological perspective, as there’s something for everyone in this growing Collaborative Economy. Yesterday, Stephanie Agresta brought nine tech and business students from Iowa’s Luther College (blog) to meet me at our Foster City office for some Q&A about the business world they’re about to enter. This day, Jan 20th was the first day Obama has been in office, and he’s already made some significant changes within his first hours in the oval office. We had an interesting conversation, we talked about creating career websites, starting blogs, and how to represent yourself in a professional way. We discussed how sharing online is likely permanent and you should assume your boss, your mother, and your future wife/husband will read whatever you say online. How they should start preparing for the job market, and some practical tips to use social networks to find jobs. Their President was always their Facebook friend. Their President was always the top Twitter user as far as they can remember. Their President has always addressed them on Saturday mornings on YouTube. They’ll be connected to their friends to discuss topics and join causes in social networks. The “Mall” won’t just be about shopping but also refer to the Washington Mall. Blackberry’s are the new scepter of power, and a status symbol. Soon, they’ll remember how they can voice their opinion on websites like the Whitehouse.gov isn’t just a destination site, but will become a place to have two-way conversations with peers and the administration. Not all of these things are always cheery for them, as they graduate the impact of the recession may cause them to compete against others that are far more experienced and may be able to outbid them. They may understand what ‘change’ and ‘hope’ means but may not remember what the country is trying to escape. 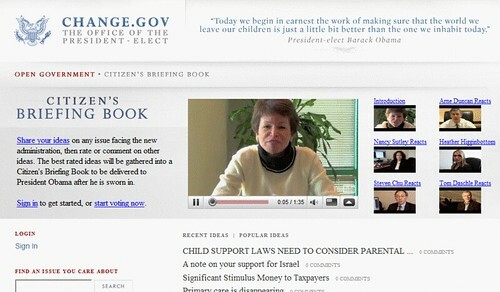 Back to you, what are the other characteristics of this Obama Generation especially as it ties back to the internet? How Did You Participate In The Inauguration? Are you old media or new? Progressive or traditional? Were you present in DC or were you participating using TV and being online? President Barack Obama’s inauguration was an interesting event, why? It wasn’t during normal evening showtimes when people would watch on TV, as a result, people found other ways to consume the event –even using iPhone apps. Secondly, although an American event, it has implications to the rest of the globe, it’s not just a limited audience. In my world, I watched it at 830am at home on HDTV, while streaming other pieces on Ustream.tv. I watched Current TV (got annoyed with the hip hop music and ridiculous tweets) and turned on CNN. I was on twitter (see charts), chatting and commenting about Aretha’s magic bow and how to be yellow mellow, and was reading the hundreds of tweets coming in every 30 seconds on Tweetscan, Summize (it couldn’t keep up) and Tweetdeck. Over on Seesmic, there were discussions from those who were watching –and it cascaded to many other social sites, at the end of the ceremony, I changed my Facebook stats to read “Jeremiah is mellow yellow” and received several replies in a matter of minutes –one from my kid sister, who says I’m old for using email. Tell me how you experienced the inauguration? Did you use mainstream media? Was it a social event for you? Did you create your own commentary and share with others? I just learned from Leverage’s Mike Walsh that Obama will receive a briefing from the top voted ideas that were submitted by the American people each evening see Change.Force.com (a play off . This method of keeping in direct communication by ‘listening’ to the citizens leans on voting style technology similar to Dell’s Ideastorm. My colleague Josh Bernoff will be pleased, as he requested this feature a few months ago. You’ll need to login and register (I suspect they can use IP addresses to determine point of origin within US) in order to confirm location but that’s not completely accurate. How can Obama extend this further? Make a similar site for all other nations to submit ideas for foreign policy. This doesn’t come without challenges of course, the system could be gamed, and there’s no promise he’ll make changes based on our feedback, we’ll see. I talk to the executives of the world’s largest brands, after Obama won the election, I get a lot less push back –it’s rare I have to have discussions now about the validity of social technologies. Of course, social technologies still come with risk, but for some reason this feels really good, we’re all a bit more connected and the internet helps to bring us together. You can see the top submitted ideas, the first one is “Ending Marijuana Prohibition” with 81080 Points, 2719 comments, and submitted on Jan 12th, which is the earliest submittal date I can find. I just logged in and voted for ending of torture and request for bullet trains, each vote cast 10 points. This last Thanksgiving was marred by the horrible deaths of over 170 victims at Mumbai’s terrorist attack. If you weren’t watching, social media played a part in helping –and hurting– the event. First hand accounts were published on twitter, including pictures of terrorists in action, in fact Forbes called this Mumbai: Twitter’s Moment. Cities, authorities, states, and governments should have a social media plan in place to prepare for disasters of all sorts. Social Technographics research indicates that these social tools are readily available and are being adopted in US, as well as other cultures. Any person connected to the internet, or has a mobile device has the ability to share information as well as scan and learn from their network, take for example this lawyer who used his blackberry to transmit emails while under siege in Mumbai. Social Tools Spread Word of Mouth, both Good and Bad We’ve multiple accounts how individuals have used blogs, video, and now Twitter to rapidly spread information during a crises, from earthquakes in China, to Fires in L.A., to Hurricanes in the South, and now terrorist attacks in India. A hundred years ago, we would never imagine how information could spread so quickly. These tools are powerful, they allow anyone to share –and hear– information transmitted from others in real time from anywhere. We learned that both true and false information was being spread from these tools, in fact for days after this Mubai event rumors were still being settled. In fact, one of the concerns in this Mumai attack is that rumors were quickly spreading, and there was no central source to verify. In some cases, conversations in Twitter (and even the retweet) can influence press, and therefore spread information to other locations impacting how emergency services could react. These Tools Enhance Existing Human Behaviors Gossip, the need to connect, and communication are natural human reactions during a crises. Like a scene at a freeway car crash, most want to know what’s happening and in the excitement, jump in to monitor and participate. Jennifer Leggio indicates that the good and bad of humans quickly show on these tools –with mixed reactions. Amy Gahran provides us with why and how citizen journalists should react and behave. Assume Terrorists Are Using Social Tools We learned that the Mumbai terrorists were using Blackberry’s to communicate and monitor. This 10 man crack commando team was able to cause extensive havoc for 3 days. They were trained, funded, and had intelligence. Just as we should expect they are monitoring the police airways and public tv stations, we learned they were monitoring online the “police responses on the internet”. It’s so very easy to do, as people were tagging content #mumbai and it’s easily searchable by Twitter. How Municipalities Should Integrate Social Media Into Disaster Planning Therefore, municipalities should learn from this tragic event, in order to understand, help reduce risk, and take advantage of the medium before an event happens. 1 Enhance Communication Plans: First of all, just as municipalities have an existing communication plan (often a press statement from police or authorities to media) understand how to repurpose these messages and communication on social tools. 2 Experiment and Build a Base: Municipalities should experiment with the tools as we learned the Department of Homeland Security is understanding how to use these tools for disasters, so cities should also start to monitor, then experiment. Just as we saw with Motrin moms, they had no base to stand on to defend themselves in Twitter –the same falls true for any ruling body. Having a platform in advance provides benefits, as those who participate have power. 3 Educate, Train, and build Awareness Before an Event. Governing bodies often have mock emergency response trials, now, start to incorporate these tools into the planning process. You’ll have to indicate to the world what is an official channel, where people should go for news, and how each authority plans to respond using these tools. These tools can help educate citizens how to prepare for disasters, where to go for help, how to develop a family crises plan, and even basic life saving medical techniques. 4 Develop a Crisis plan: It’s far to bold to suggest that each governing body use these tools during an emergency. Perhaps they are focused on keeping information quiet in order to save lives, are unaware of what the truth is, or simply don’t have the resources. Even so, municipalities should expect information to rapidly spread amongst those witnessing the tragedy, and commented by others. Likely, like a triage plan, a similar plan for social media should be created depending on the type of disaster occurring. 5 Use These Tools To Rebuild: Even if the municipality chooses not to participate during the crises, these tools can help rebuild after the tragedy. The Red Cross has been using blogs, Facebook causes, twitter, and a variety of other tools to help spread awareness to drive donations, and to get people involved. If you have other suggestions to help municipalities with understand and use these tools to their benefit, leave a comment below.